When last I wrote about the redwood planters (Planter Project - Part 1), I hadn't yet filled them with soil and plants. 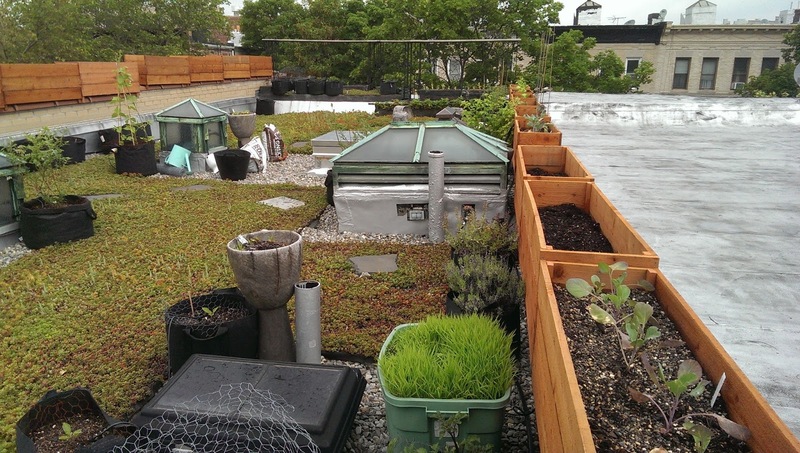 I ended up making 19 of them in total, and I can't remember for sure how many bags of potting soil I carried up to the roof. I think it was 4 bags per planter, but I've brought up some compost and stuff since then as well. Just to button things up, here's a little photo-journal of the rest of the story. 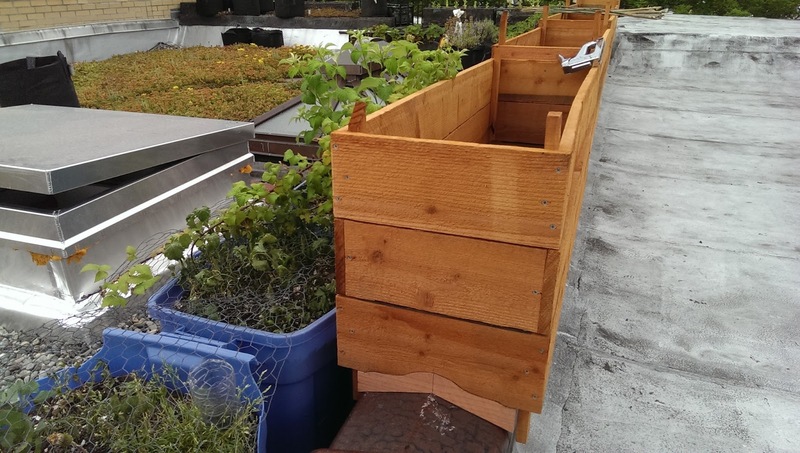 Once I had all the planters built, I decided I should level them so the water in the bottom tank portion of the planters would be the same distance from the filter fabric along the full length of the planter. 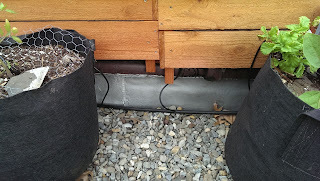 If they were left to rest evenly on the parapet wall, the water would have filled up to the fabric on one end, and barely made it into the net cup on the other end. I got the first shimmed and leveled, and then I could fine-tune the shimming and leveling of the subsequent planters down the line. The were then screwed to each other. 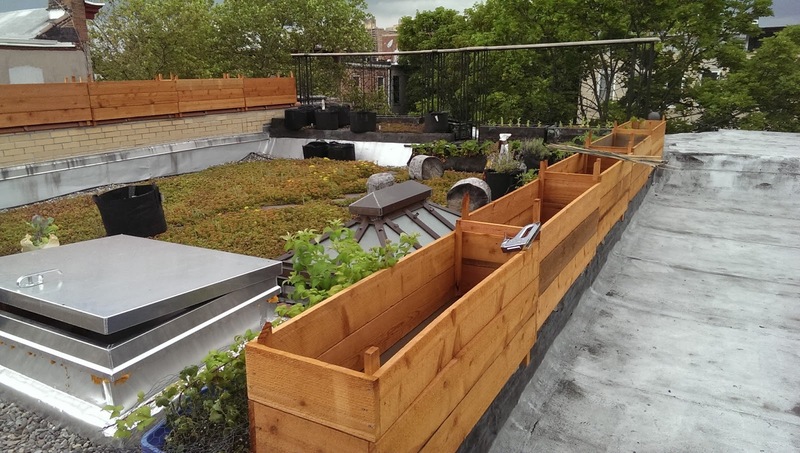 I have a 1/2" drip irrigation line running around the perimeter of the roof, and I have one 1/4" line branching off for each planter (in addition to the other lines branching off for pots and such). 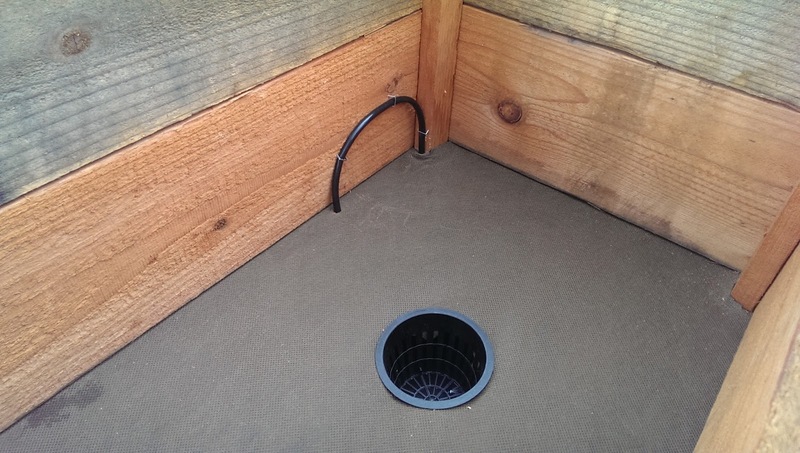 The line runs up, between the pond liner and the redwood, then it pokes up through the filter fabric, before arching back down, and poking through the filter fabric into the inside of the pond liner tank. Shimming and plumbing my way down the line. 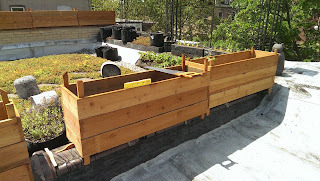 It's too bad I cut the parapet capstone profiles into the bottoms of both ends of the planters. I ended up having to fill them with scrap pieces on the down-slope ends. I had some seedlings from the farmer's market waiting in this planter. Once all the planters were shimmed and plumbed, I cut the top horns off. I know it doesn't have much to do with the planters, but I bought some blueberry plants last year, and I was very impressed that they actually made blueberries! On the roof! 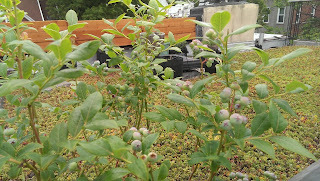 And they are producing even more this year! These planters really allowed me to increase our crops last year. This is from May, 2015. 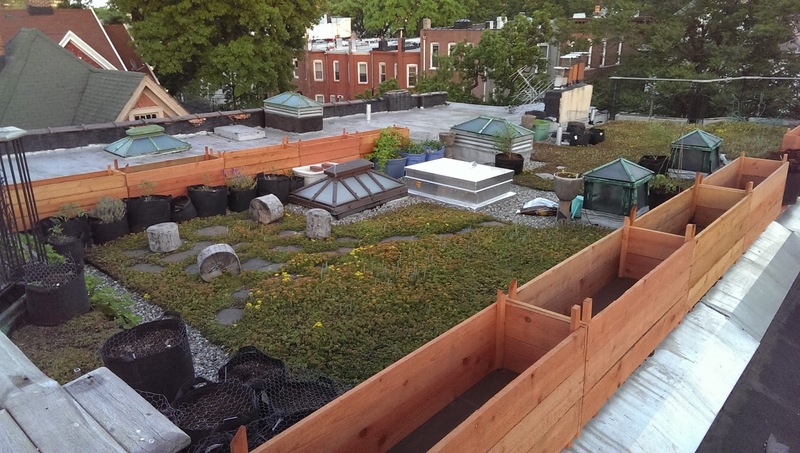 And here's how things looked in July, 2015. 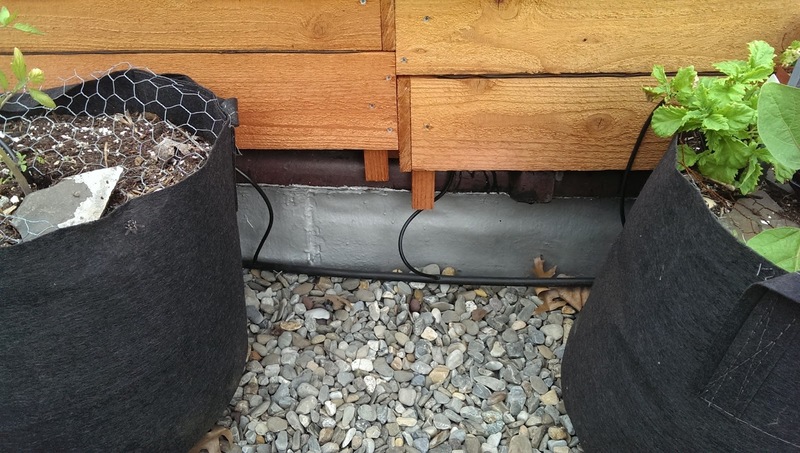 The drip irrigation system turns on for 20 minutes, 3 times/week. It waters all the potted plants, and it fills all the reservoirs in the planters. Some day, if I ever make a second generation of these planters, I'm going to work out a float valve system that will allow the reservoirs to stay full all the time. But, for now, it's working well enough. 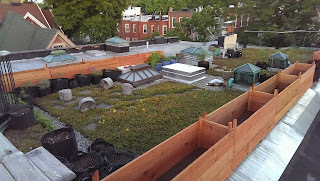 It's fun to go back now (May, 2016) and see these pictures of how the roof had gotten even woolier by August of 2015. 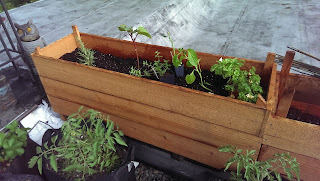 I'm planning to make a special redwood planter for a small crab apple tree this year. And I'm going to try planting tall plants on the short side and short plants on the tall side. 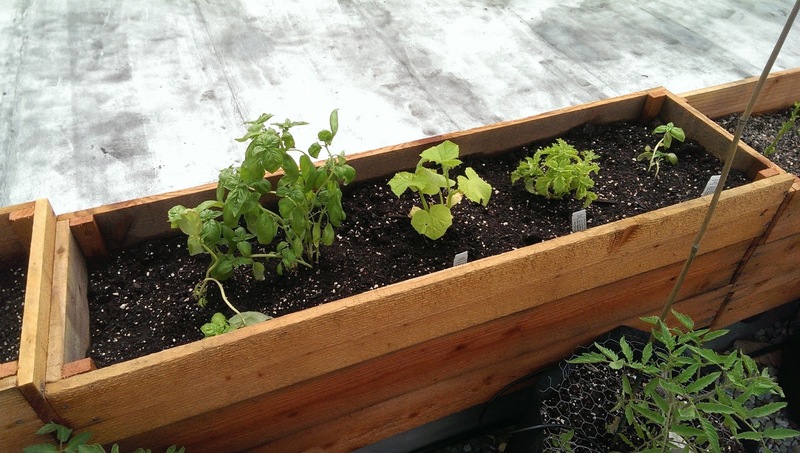 Project Happy Spring! 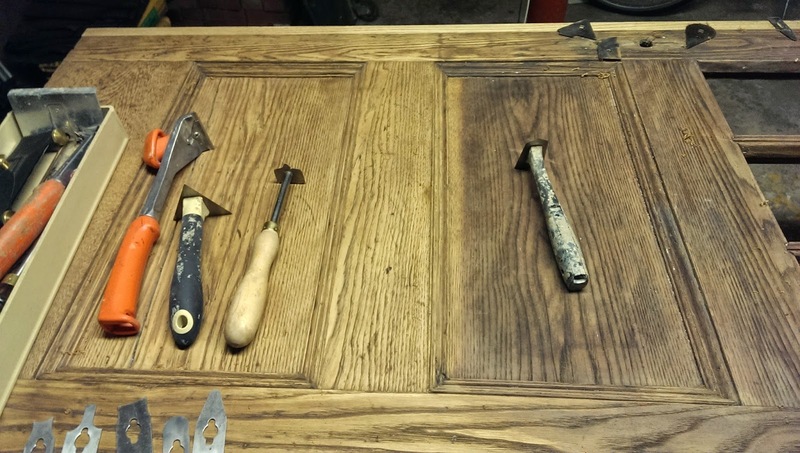 This past weekend, I finally finished a project that has been no less than 4 years and 3 months in the making: the restoration of our kitchen door and door jamb. 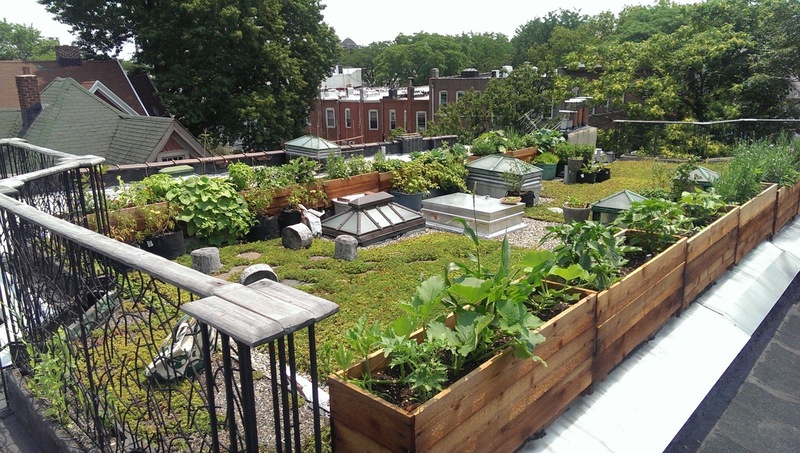 Here's a photo of what it looked like in 2005 when I was in the process of buying our house. Notice that all the walls in the entire house were painted that weird brown. 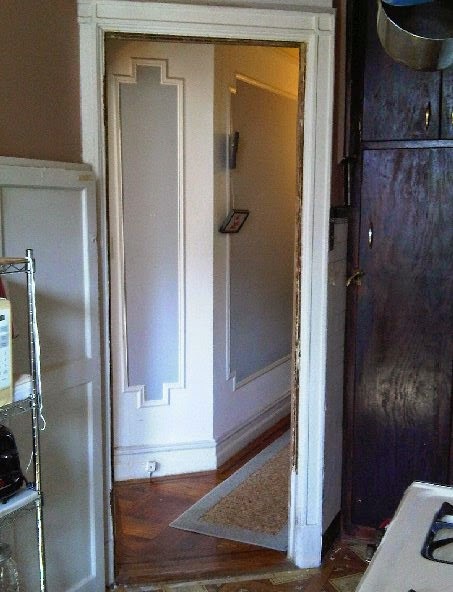 And all the original woodwork was buried under several coats of paint. 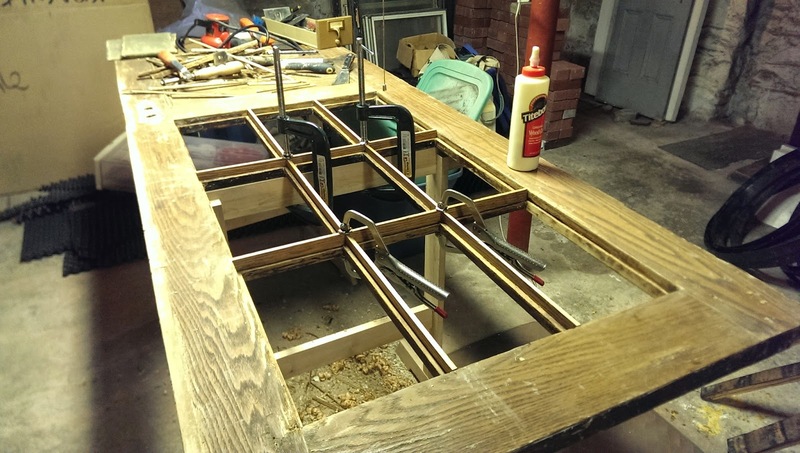 In 2010, I pulled the door out, took it downstairs to the basement, and started working on the door frame. 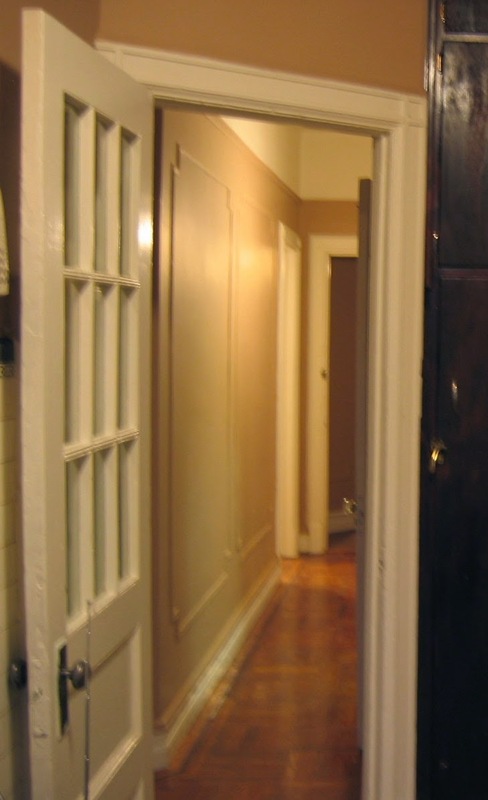 You can see I'd re-painted the hallway by then. I still haven't gotten around to replacing the dark brown plywood cabinets on the right side of these pictures. 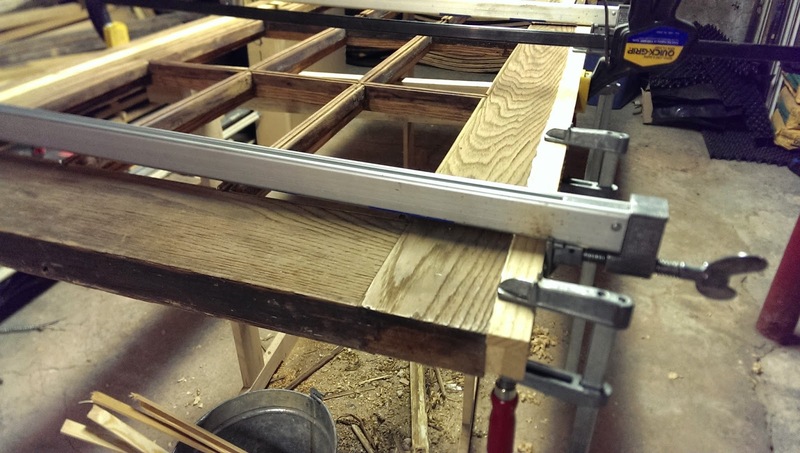 In the early days, I didn't have my saw horses built, so I was using my old tablesaw for a work bench. With the paint removed, I found that the spot for the bottom hinge was completely splintering out. I screwed some backer wood behind the good wood, and created an oak patch for the hole. I later plugged the screw holes with oak plugs. I didn't take any photos of the main door-stripping process. Cindy did most of the early work with a heat gun and scrapers. 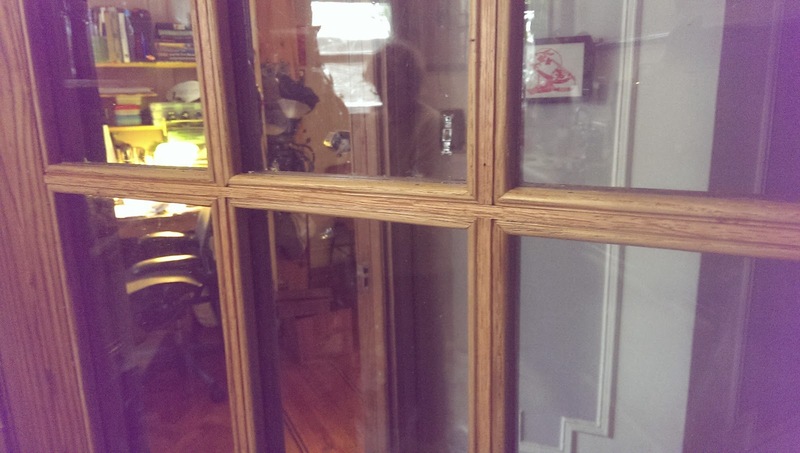 A few of the window panes were cracked in the process, and Cindy felt so badly about it, she basically stopped working on the door, and it sat in the basement for a couple of years. 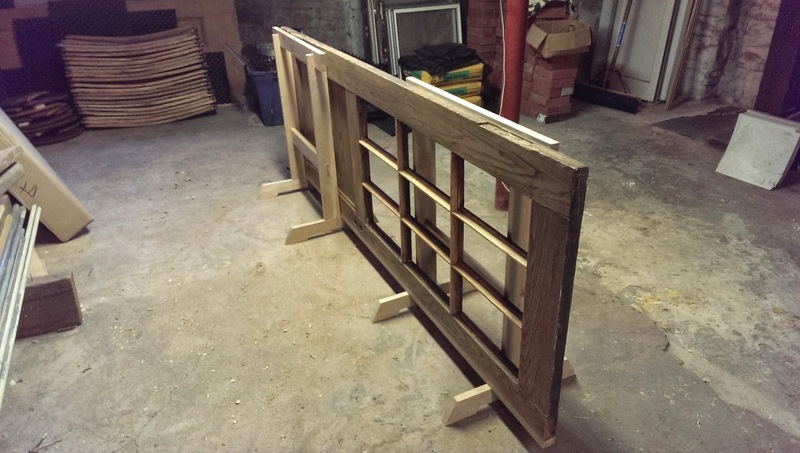 I built some sawhorses in 2013, and I found them to be perfect for the kitchen door, so I started working on it when it was too rainy or hot for working on the green roof. 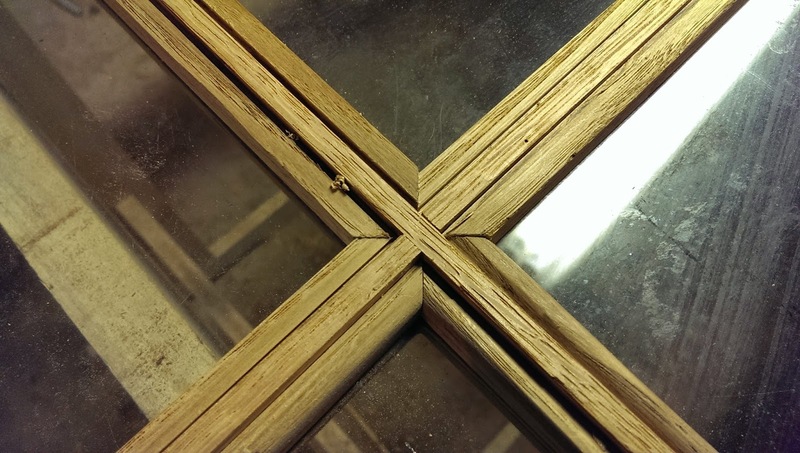 I removed the window panes and discovered that the wood around the windows was splintered and too weak to keep. At first, I hoped to just replace what was too weak to keep. I couldn't get any kind of router plane (electric or otherwise) in there to make channels for new dividers, so I hand chiseled them by giving my chisel a couple of taps to raise a chip of wood, then moving down the line about 1/16" and doing it again. Once you've got a bunch of wood chips standing up in the channel, you can go back through, scrape them off, and smooth the bottom of the channel. 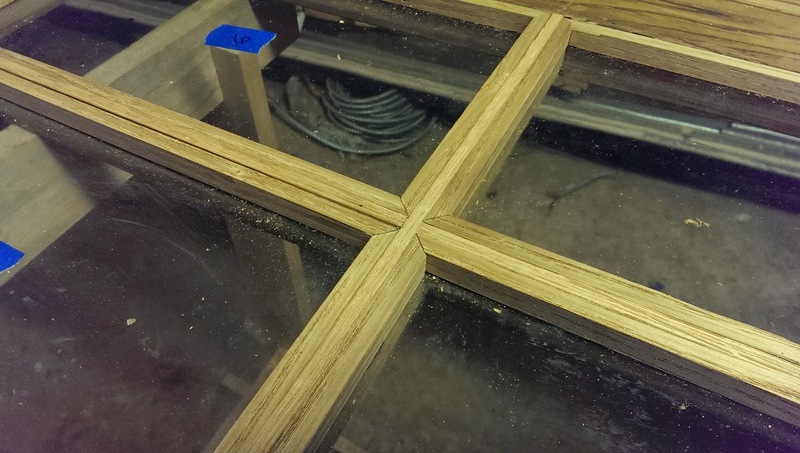 Once I'd done all of them, I milled some oak and cut some ship-lap joints for the intersections and glued them in place. 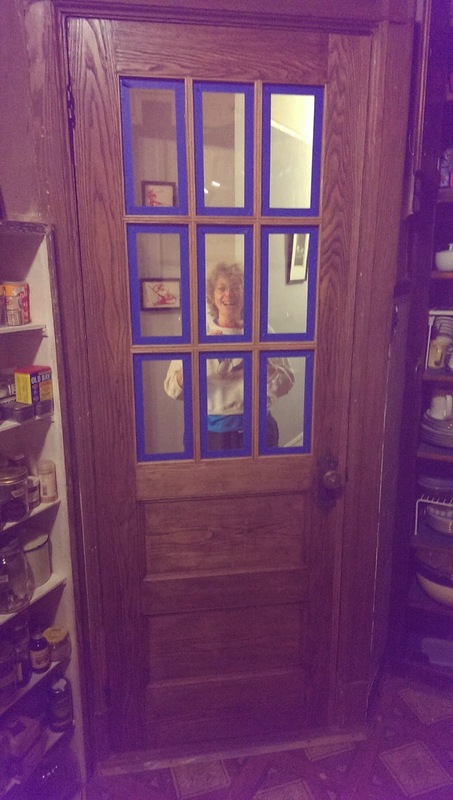 In the photo below, you can just barely see that there was a long strip of light, tight-grained wood along the edge of the door that we uncovered when we stripped all the paint off. 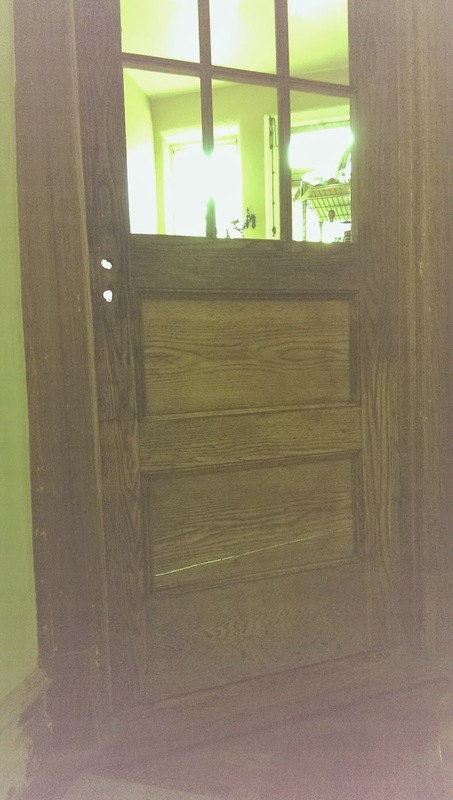 At some point, someone had tacked a long wedge of douglas fir (or some such stuff) along the whole length of the door. 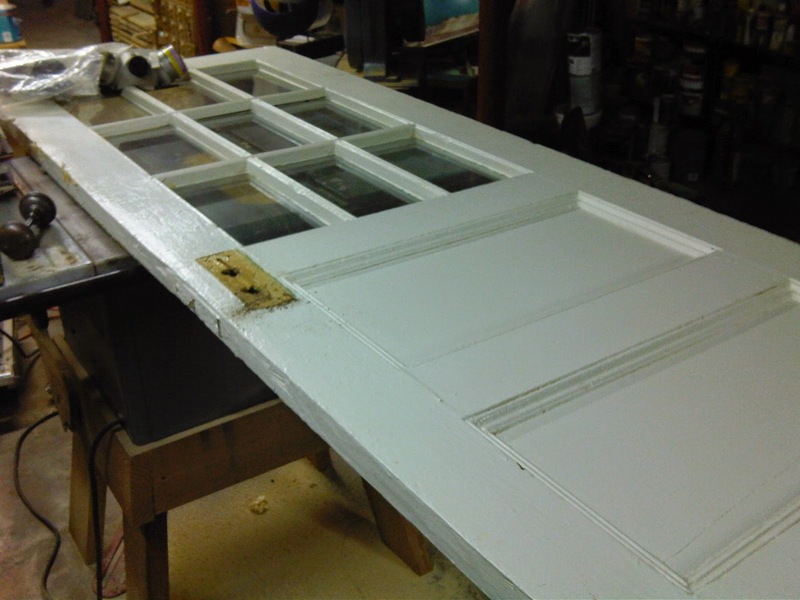 I don't know if the original edge was damaged, or if the house long ago settled and it no longer fit the jamb properly, but because I had no intention of re-painting the door, I needed to replace that wood with something that looked more appropriate. 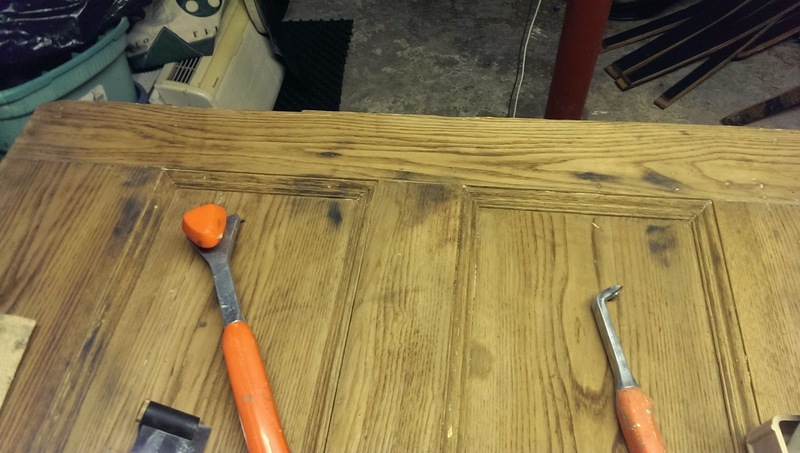 The trouble is, I wasn't 100% sure the door was oak, and I wasn't 100% sure how to go about replacing that strip properly. 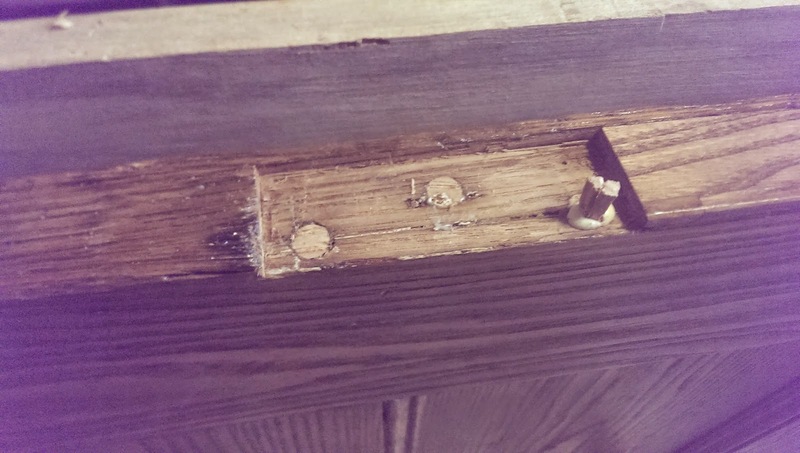 I thought about and procrastinated about that problem for several months while I turned my attention to scraping away the burn marks left behind from Cindy's early experience with the heat gun (another reason why she shied away from continuing to work on the door). 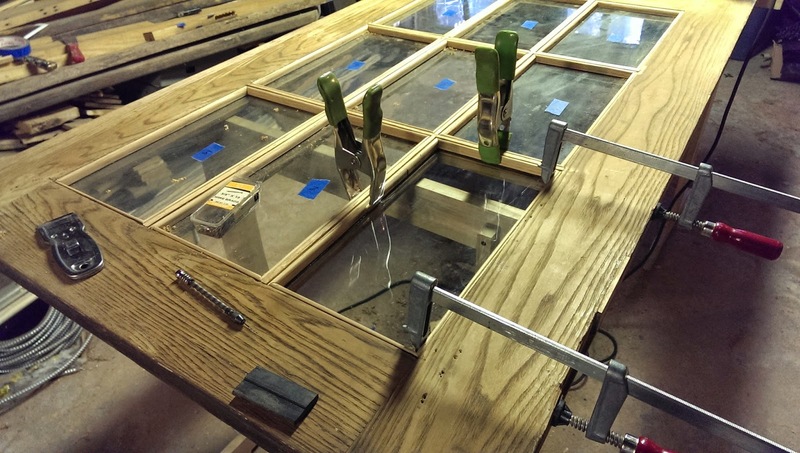 One day, I realized I could clamp a straight edge to the door, pull the offending wedge of wood off the edge, route a clean edge along the length of the door (using the straight edge), nail on a replacement strip of the secondary wood (most doors are actually made of two different types of wood - a cheap one on the inside, and a thick veneer of the good stuff on the outside), and then glue on a strip of primary wood to bring the door back to it's proper width. 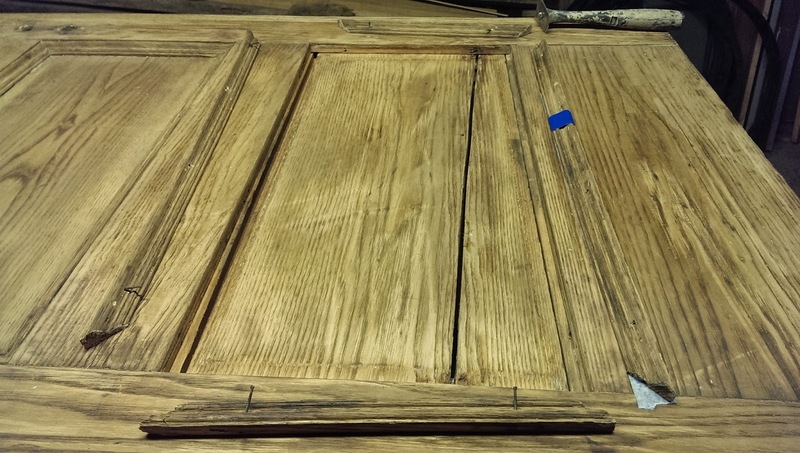 There was a good chance the door was oak, but when I started trying to find some oak that matched the door's grain patterns, I couldn't find a match. 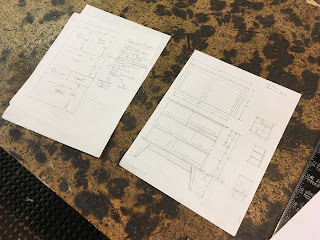 So I began investigating American Chestnut wood, which I had always sort of suspected might have been what our woodwork was made out of when I wasn't thinking it was oak. The American Chestnut tree used to be the most prevalent tree in our North American forests. 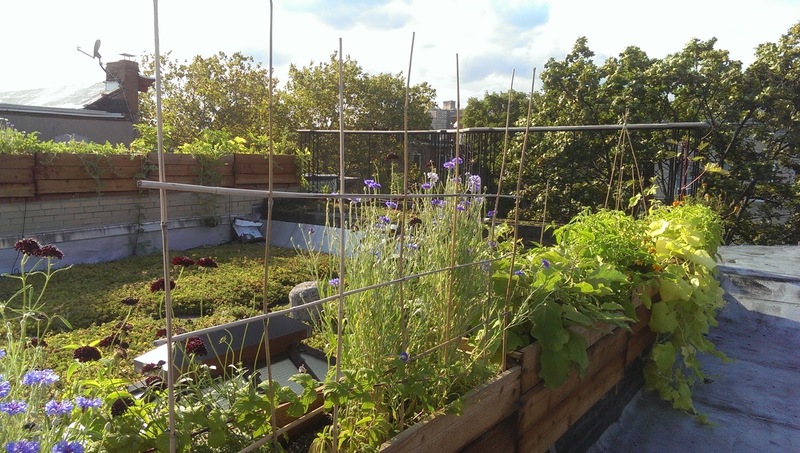 But it has been nearly extincted by a blight. It is essentially impossible for any remaining American Chestnut trees to grow large enough to reproduce or to be suitable for lumber, so the only way to get American Chestnut lumber is through salvage dealers. After a lot of searching, I found a company in Massachusetts that had a few thin boards of the furniture-grade quality I needed in order to be able to patch my door. 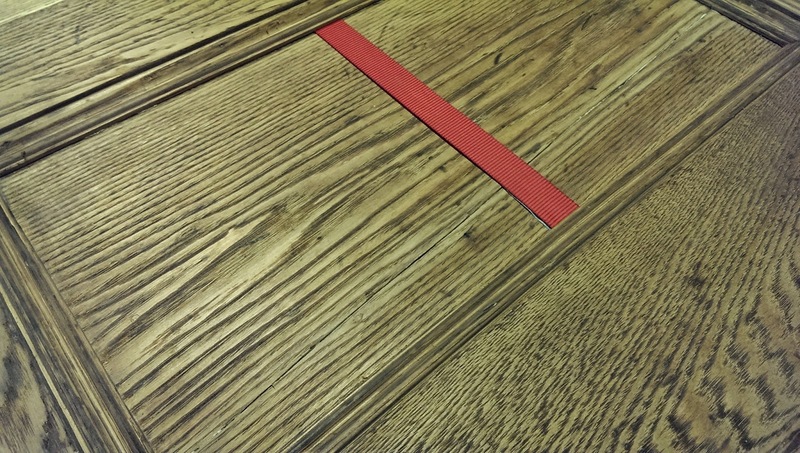 This is a photo of the secondary wood strip attached to the door with the American Chestnut wood glued on for the final "show" edge. After the glue dried on the above edge pieces, I planed the edge flush with the interior strip of wood and began gluing on the front and back veneers. Then I clamped the door to my work table and planed the face veneer flush with the edge veneer. By the way, that antique coffin style plane is dreamy. 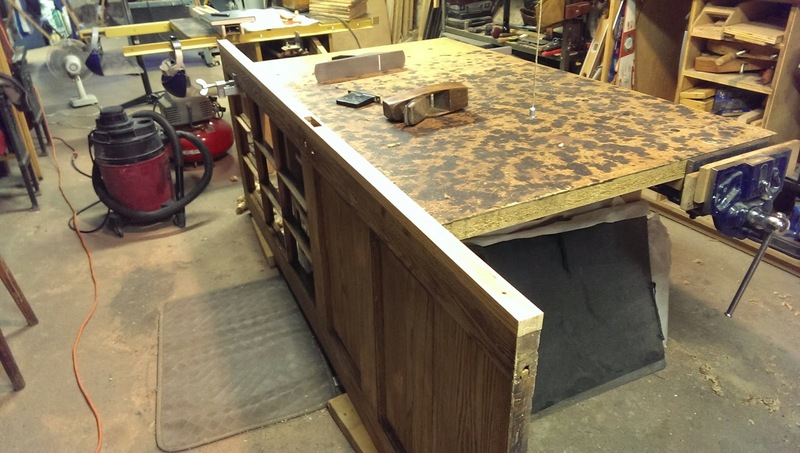 It's around this time when I figured out I can wake up early and get some shop time in before my day job, so this project really started to move along much faster. It took me about 4 years and 2 months to get to this point. The rest only took about 4 more weeks! 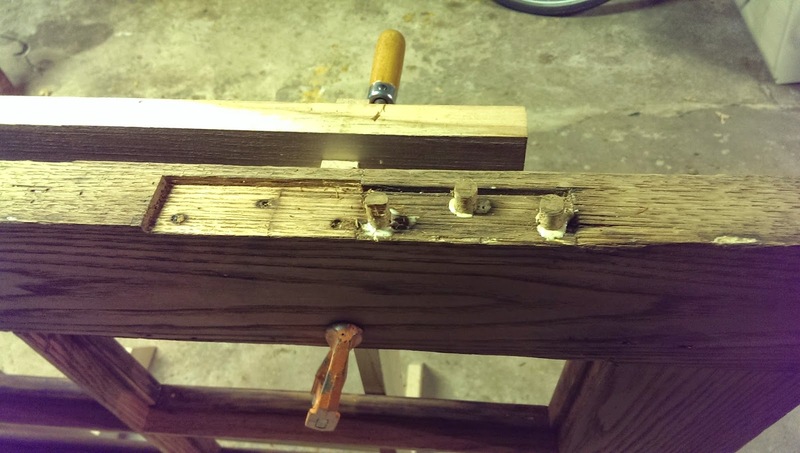 Then I figured out I could use my saw horses as an elegant way of holding the door up while I worked on patching the bad hinge mortises and filling the old screw holes with pegs. 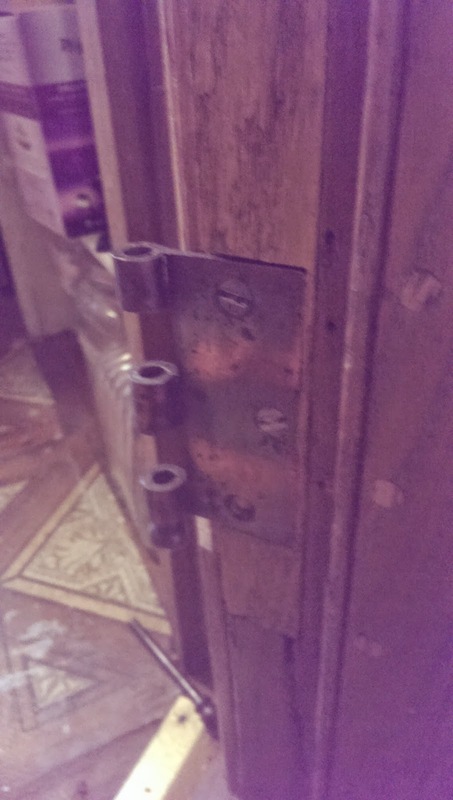 The original screws had probably started pulling out of their holes, so someone moved the hinges to fresh wood at the top and bottom of the door. 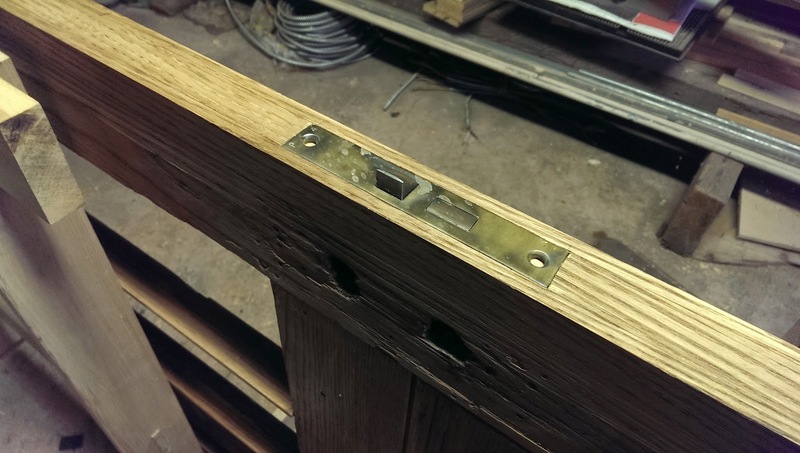 That's why there was a second hinge mortise to patch. 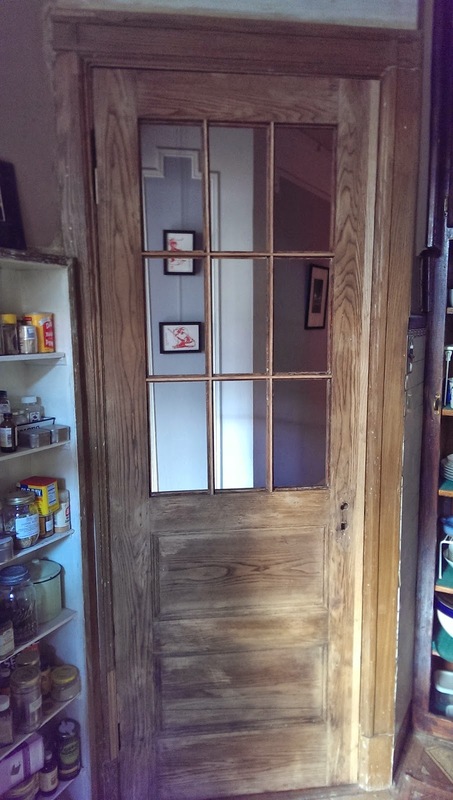 One side of the door was originally stained a very dark color. Here's the stain getting scraped off. 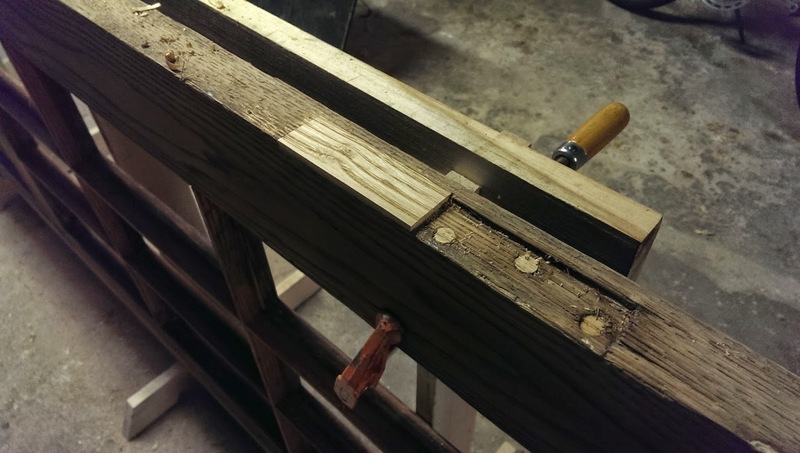 I had left the new edge on the door an extra 3/16" wider than the original, so I brought the door up to the kitchen to see how much of that wood I needed to shave off. But it fit just the way it was! You'll also notice that my new American Chestnut wood is awfully bright compared to the original stuff. Although I didn't take any pictures of it, after I had the door back down to the workshop, I did some experiments with wood dye and made the new wood match the old a bit better. 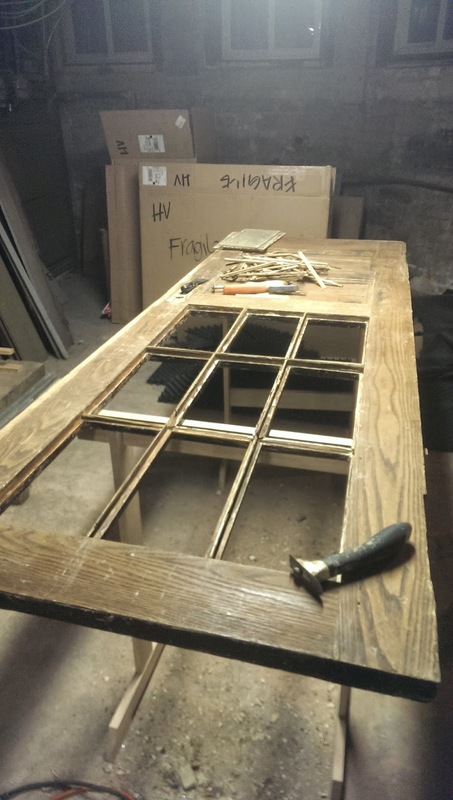 I was talking to Cindy about making it perfect, and she mentioned that she liked being able to see it a little bit - it sort of tells the history of the door. In later pictures (below), you can still see the patch, but it's blended in somewhat - just the way I left it. The light in this photo below is wonky, but you can see that the bottom panel of the door was cracked. I had been debating about whether to try to glue the panel back together, and after seeing the light stream through, I decided I had to give it a shot. First, I gently pulled the molding out from around the panel. I broke one piece in the process, but it glued back together pretty seamlessly. 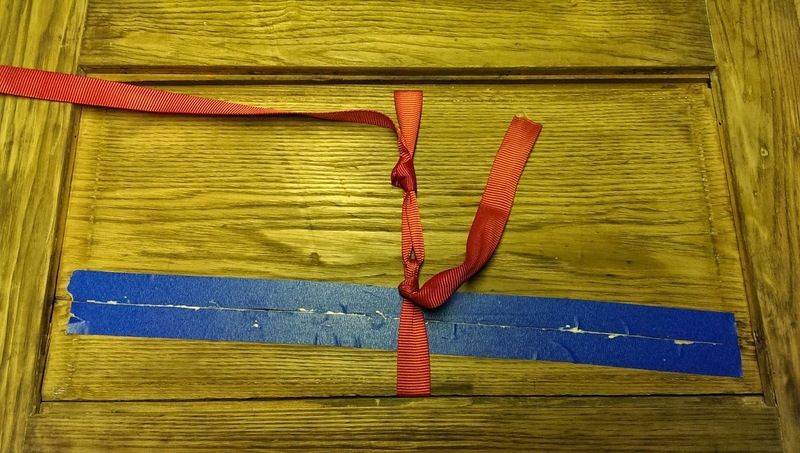 I put blue tape on either side of the crack to keep the glue squeeze out from making a mess of the wood. The panel was tucked under the veneer on the side rails of the door on both sides, so it was impossible to take out without breaking. I decided to thread the end of a ratchet strap around the panel and tie it tight for my make-shift clamp. I couldn't wait to see how the crack looked after I took the blue tape off, so I flipped the door over for a look. It's not perfect, but it's not bad either. The glue wasn't completely dry yet, so that strap was still on there. Here's my mortise for the lock. 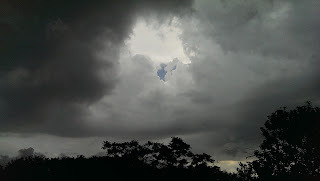 And finally, I turned my attention back to the windows. 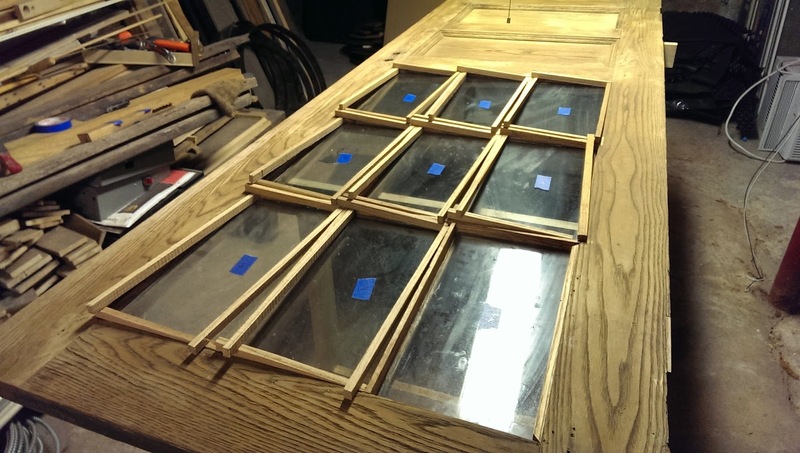 I cut new panes of glass to replace all the broken ones (I broke a few myself too - it wasn't all Cindy's fault). I have collected a bunch of old windows off the street from time to time, so I have a good stock of old glass lying around. It took a long time to clean it up, but I love that it's a bit scratched and has waves and bubbles in it. 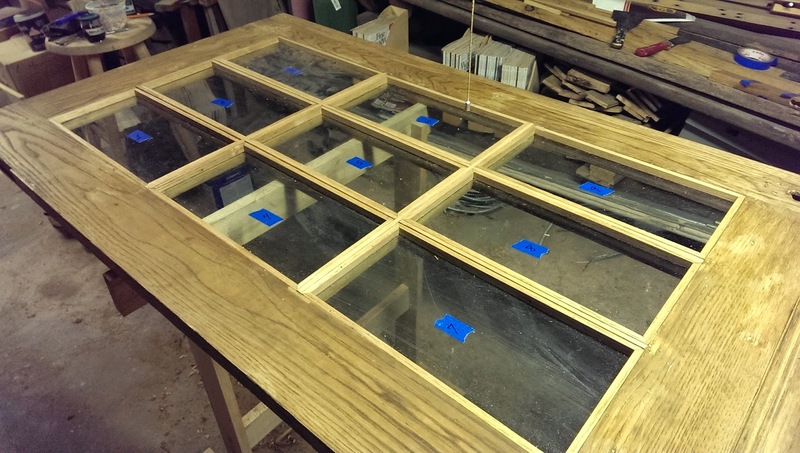 In this picture I'd milled a bunch of sticks out of more of the American Chestnut wood to hold the glass panes in place. 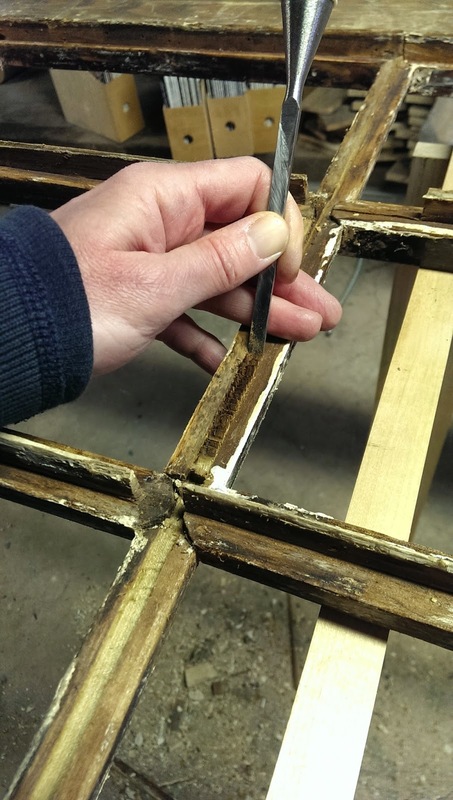 All the sticks were hand mitered to fit. Then I started shaping them by hand. 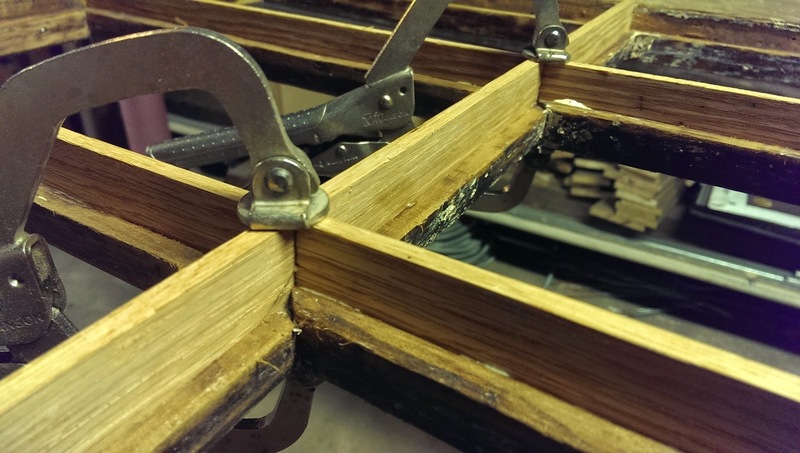 Once they were all done, I clamped and nailed them into place. 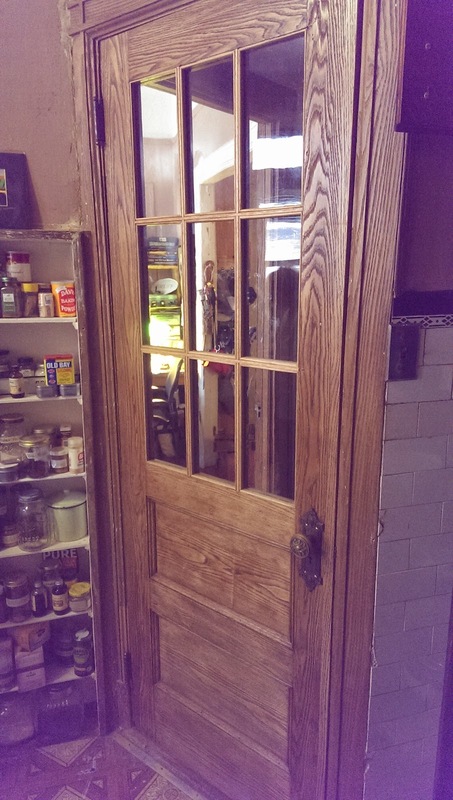 I finished the door with two coats of a clear, satin water-based polyurethane finish. That's blue tape to protect the glass from getting a bunch of finish on it. 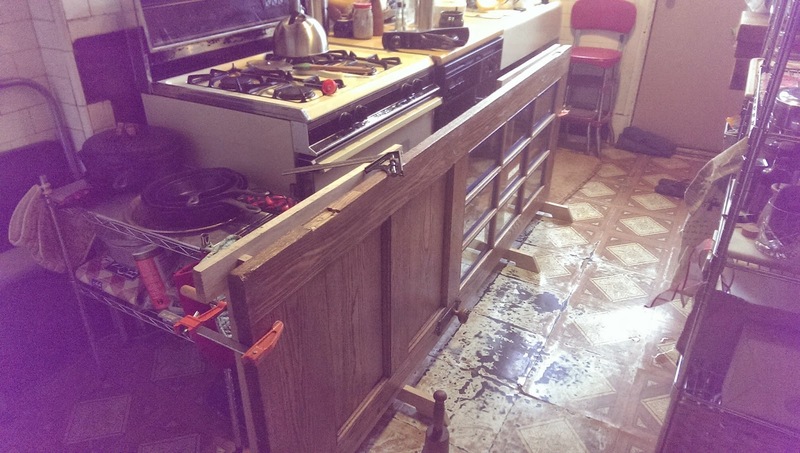 I was very excited to install the door back in the kitchen, but my first attempt didn't quite work. You can't really tell from the photo, but the door didn't close all the way. I had to mortise the lower hinge deeper into the door jamb. And I had to re-patch and re-install the upper hinge on the door. I really love those saw horses. And, yup, that's our kitchen floor. It was pretty much worn out when we bought the house, and I still haven't found the time to replace it. 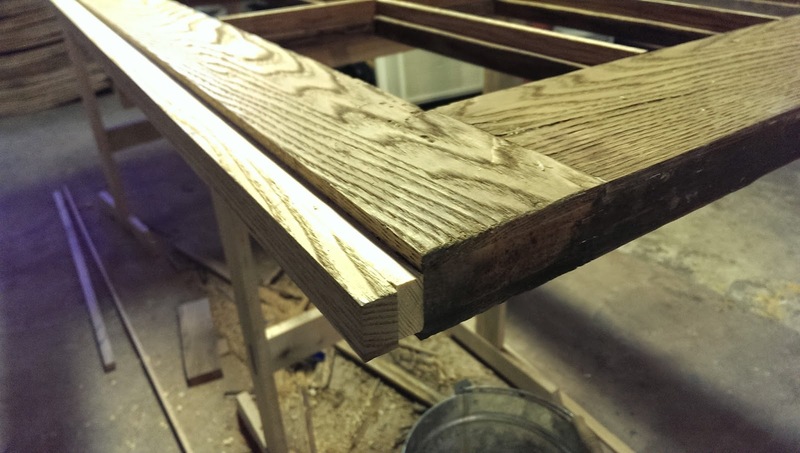 I'm particularly proud of how the new wood to keep the windows in place turned out. And there's Cindy's silhouette reflected in the window. She was making us eggs and lox. Man, I can't tell you how nice it is to have that ding-dang kitchen door back in the kitchen where it belongs. Wow.